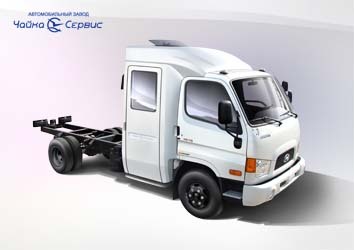 In 2010, the car factory "Chaika-Service" from Nijnii Novgorod (Russia) plans to release a double-row cab-based on Hyundai chassis. There will be two variants of the cabin: 1) 3 place + cupboard, 2) 4 place (second row cab). This car provides comfortable transportation of 6-7 man team, including the driver. For easier access to the engine cab will lean forward. Also, "Chaikal-Service" began to develop of the new two-row cabin on Isuzu chassis, sketches of which were shown at the 10th international specialized exhibition" Commercial Transport 2010" in Moscow.